We don’t hold hours but we have a self-serve cheese fridge and meat freezer and you are welcome to walk around back and say hi to the sheep and goats anytime! 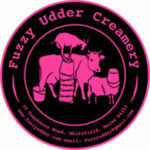 Fuzzy Udder Creamery makes fresh, soft-ripened, and aged cheese made from sheep, goat, and cow’s milk. We milk east-fresian dairy sheep and alpine/sanaan/oberhasli cross dairy goats and buy in organic jersey cow’s milk from Two Loons Farm. We rotationally graze our sheep and goats on pasture while the grass is growing and feed high quality 2nd cut hay in the winter months. We buy organic grain and Maine grown oats. Our critters dine on seaweed and minerals daily and are raised with love of love and snuggles. Fuzzy Udder began in 2012. Some of the cheeses we make include: fresh hand-stretched mozzarella, sheep milk yogurt, fresh sheep cheese, our award winning Tempest (cow’s milk tomme style), Windswept (our sheep and goat gouda style), brie styles, ashed cheese and washed rinds. We have a 24/7 self-serve sale fridge at our farm and sell cheese at numerous retail and restaurant locations throughout Maine. We also sell at the following farmer’s markets: Orono, Damarascotta, Camden, Bar Harbor and Bath.